Yuzhnoye N2O4/UDMH rocket engine. Tsyklon 2 and 3 stage 3; Ikar. In production. Based on RD-854. Thrust vector control by 4 nozzles (thrust 98 N each) fed from a gas generator. First flight 1965. AKA: 11D25;D-25;S5.23;S5.23, D-25. Status: In production. Date: 1968-72. Number: 229 . 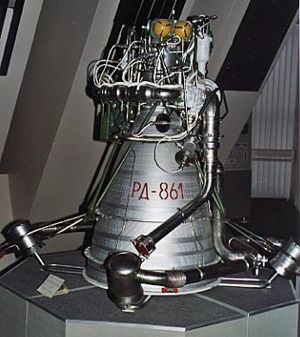 Thrust: 78.71 kN (17,695 lbf). Unfuelled mass: 123 kg (271 lb). Specific impulse: 317 s. Burn time: 130 s. Height: 1.56 m (5.11 ft). Diameter: 1.53 m (5.01 ft). Mass given in ref. IAF-97-S.1.04 is 162 kg instead of 123 kg originally stated. Chambers: 1 + 4 + 2. Engine: 123 kg (271 lb). Chamber Pressure: 88.80 bar. Area Ratio: 112.4. Thrust to Weight Ratio: 65.25. Oxidizer to Fuel Ratio: 2.1. Family: Storable liquid. Country: Ukraine. Launch Vehicles: Tsiklon-2, Tsiklon-3. Propellants: N2O4/UDMH. Stages: Tsyklon 2-3, Tsyklon 3-3. Agency: Yuzhnoye. Bibliography: 326, 348, 42, 4477.